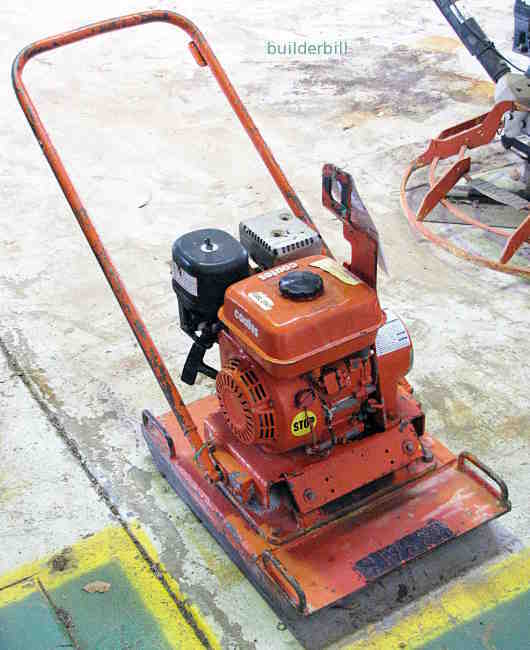 An engine driven vibrating steel plate for use in the compaction of back fill in trenches and other fairly small flat areas, say up to a house slab size. The flat plate compactor gives a smoother finish than a wacker packer and even though it can be used in quite large trenches, it is more suited for flat work like compacting sub grade for concrete slabs on the ground. Never start any compactor on concrete. Always have it on earth or sand or gravel to start it. Start on idle and holding the thing firmly gradually increase the revs. It should vibrating and slowly moving forwards. The machine can be steered by pushing the handle left or right. At the end of a section the handle can be flipped 180 degrees and the operator manoeuvre in tight spaces if required. Ideally the fill material should be placed and compacted in no more that 150mm 6" layers. The fill material should be raked or screeded to a flat surface as the final levels are reached. These machine are capable of producing accurate levels and it is always worth while to take the extra trouble know that extra concrete cost a lot more than extra fill.